Where is the Rosetta spacecraft right now? The app above shows the live position of Rosetta spacecraft (and comet 67P) right now, live. You can also wind the animation backwards in time to watch its launch and its flybys of the Earth, Mars and two asteroids. Use the 2D/3D button to see 3D "stalk" to represent height above/below the plane of the ecliptic. Final images captured by ESA's Rosetta spacecraft just before impace with the comet. The left hand shot was taken at approx 5-10m from the surface and the right hand image at 750m. Rosetta was deorbited onto the comet at 2016/09/30 11:20 UTC (2016/09/30 11:20 UTC). It was able to take pictures throughout it's descent with the final image at 10 metres above the comet surface. The successful plan was to gradually decrease the orbit so that Rosetta could get really close images of the surface. This should allow past activity to be linked to interesting surface features. Click for ESA's mission end article. This mission has been an amazing success. It is difficult to remember that only 2.5 years ago we knew next to nothing about the structure of a comet and how it behaved as it became warmed by the Sun and created its tail. The best images of an active comet were of a hazy blob as taken by Giotto as it rendezvoused with Halley’s comet. There were many theories about how a comet would behave but for the first time we have witnessed these processes with a grandstand view. The data captured by Rosetta and Philae will keep scientists busy for decades to come. During Rosetta's mission, among other discoveries, it has detected that the comet makes a much larger than expected hole in the solar winds magnetic field and also that the comet appears to have a very even structure with no large cavities under the surface. Normal: These regular flows of material start in the comets morning and end in the evening and are related to the amount of solar illumination on the surface. They look almost identical each day. Short Lived Outburts: These unpredictable and violent bursts have been detected in single frames from Rosetta meaning they can be measured at lasting less than 5 to 30 mins long. At least half seemed to be triggered as the Sun comes up on the comet which is thought to cause thermal stresses resulting in movement on the surface which might expose volatile materials to the Sun. Short Lived Type A - Jet: are defined by an obvious narrow jet that extends far into space. Short Lived Type B - Plume: are defined as originating from a wide base and and fanning out as it travels into space. Short Lived Type C - Complex: are more complex and exhibit both type A and B characteristics - e.g. the material fans out from a large base but some more intense parallel beams are visible within the outburts. For a full explanation, visit the ESA Site. The location of the Philae lander has now been found. The Rosetta team are very relieved to have found the exact resting place of Philae since it means they can now interpret the data gained from the lander with certainty of its location. It also means that they can concentrate all their efforts into preparing for Rosetta's impact with the comet in a few days time. Article. 08:15 - Why comets are important. 16:20 - Spacecraft and comet represented by audience members running about the stage. 19:40 - How Rosetta took a long time to get to the comet and how the comet was unknown when the mission was designed. 27:30 - Comet Size (2.5 miles across) and made of 2 planetesimals and is "fluffy"
32:20 - Did comets contribute to the earths atmosphere? 54:40 - Q&A : Internal structure of the comet - darkness of surface? 56:45 - Q&A : How fast do jet silos get filled? 58:25 - Q&A : What do we know about comet generated meteor shower particulates? 1:01:35 - Q&A : Is the asteroid belt currently forming bigger or smaller objects? 1:03:30 - Q&A : When will the comet reappear? 1:04:45 - Q&A : What will we know from the landing or Rosetta? 1:06:58 - Q&A : Why not use thermo electric generators? 1:08:25 - Q&A : How do you recognise a crater from a jet vents. 1:09:45 - Q&A : Will Rosetta be functional when it lands? 1:10:40 - Q&A : What was the temperature on the comet? 1:13:15 - Q&A : What effect will Rosetta's crash be on the comet? 1:14:30 - Q&A : How did the gases get into the comet? 1:15:28 - Q&A : How did you design the instruments? 1:17:50 - Q&A : Main reason to use solar panels? 1:19:18 - Q&A : Why did you choose this comet rather than another? 1:21:02 - Q&A : What mineral is closest density to the comet? 1:21:38 - Q&A : How did the gases form in the comet? 1:22:10 - Q&A : Was the communications delay taken into account when landing philae? Click on the image above to open ESA's Interactive Comet App. It allows you to see the comet from all angles, to see what the regions are have been called, and to see Rosetta images against the position they were taken in. For more information on the App click here. The above video shows the 2 hour ESA hang out session which occurred at the time of Perihelion. Although it is a bit dry and covers a lot of old ground it does include lots of nuggets of interesting and detailed information. The most spectacular section is from 52:40 to 1:03 which shows fantastic images of the jets of gases and dust coming off the comet nucleus. A short-lived outburst from Comet 67P/Churyumov-Gerasimenko was captured by Rosetta's OSIRIS narrow-angle camera on 29 July 2015. The image at left was taken at 13:06 GMT and does not show any visible signs of the jet. It is very strong in the middle image captured at 13:24 GMT. Residual traces of activity are only very faintly visible in the final image taken at 13:42 GMT. Credits: ESA/Rosetta/MPS for OSIRIS Team MPS/UPD/LAM/IAA/SSO/INTA/UPM/DASP/IDA. Click for full story. COSAC analysed samples entering tubes at the bottom of the lander kicked up during the first touchdown, dominated by the volatile ingredients of ice-poor dust grains. This revealed a suite of 16 organic compounds comprising numerous carbon and nitrogen-rich compounds, including four compounds - methyl isocyanate, acetone, propionaldehyde and acetamide - that have never before been detected in comets. Meanwhile, Ptolemy sampled ambient gas entering tubes at the top of the lander and detected the main components of coma gases - water vapour, carbon monoxide and carbon dioxide, along with smaller amounts of carbon-bearing organic compounds, including formaldehyde. Radio waves sent through the comet between Philae and Rosetta as Rosetta orbited have provided details of the interior of the smaller lobe of the comet to be analysed. The results show that the lobe is loosely packed dust and ice - mostly (ice) - in a evenly distributed mix. Moving below the surface, unique information concerning the global interior structure of the comet was provided by CONSERT, which passed radio waves through the nucleus between the lander and the orbiter. 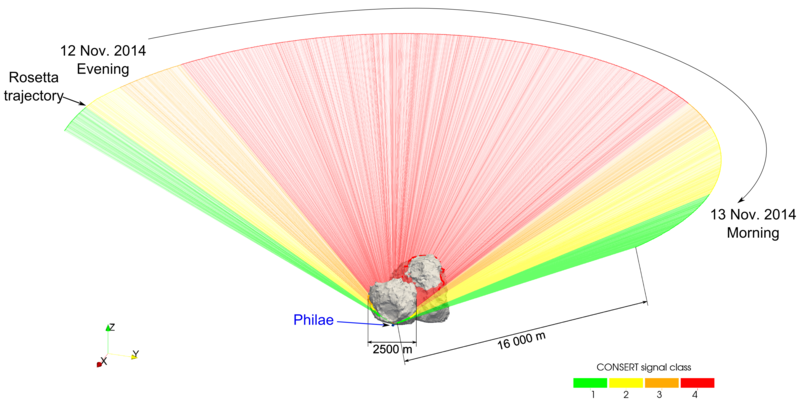 The results show that the small lobe of the comet is consistent with a very loosely compacted (porosity 75-85%) mixture of dust and ice (dust-to-ice ratio 0.4-2.6 by volume) that is fairly homogeneous on the scale of tens of metres. As this article stated - the lander "Philae" has not been heard of since 9th July 2015. Attempts to send commands to it have ceased but Rosetta will continue to listen on the off chance that Philae awakens. Rosetta's mission continues and now that the comet is further away from the sun, and therefore it is not so active, Rosetta can get closer where it is more likely to hear low power transmissions. Also as it gets closer to the comet - prior to its impact with it in September 2016, it might be able to image Philae. This would be useful in order to understand what happened to it and also to be able to more precisely interpret the data received from Philae immediately after landing. The peeps at ESA have provided a juicy (and very technical) explanation of their struggles to get Philae to talk at the Rosetta Blog. this confirms that nothing has been heard from the lander since 9th July 2015. Communications have not been helped by the fact that Rosetta has been keeping its distance from the active comet. However, now that the comet is racing away from the sun its activity will be slacking off allowing Rosetta to move closer. Philae should be viable - from a thermal and power perspective until the end of 2015 so up until then attempts will be made to communicate with it. The information that has been received from Philae showed that it was managing to charge its batteries but that it was having various hardware problems and operational anomalies which the team are trying to fully understand to aide their communication attempts. 20th July 2015: Philae Lander Struggling - One transmitter down and being pushed about! The Philae Lander is still not communicating properly and has not been heard from since 9th July. Engineers think that the lander has moved, possibly into a worse position, and also that one transmitter is not functioning correctly. For a full story visit the Rosetta Blog. 13th July: Philae Lander is not dead! The Rosetta team first regained communications with the Philae lander on 13th June 2015 and continues to receive sporadic and patchy communications. The lander went into hibernation very quickly after performing its main science mission on 12th November 2014. Since then it has remained out of contact due to its final resting position in which is mostly shielded from the Sun. This means that its solar panels are not being exposed to much light and therefore the lander cannot gain sufficient energy to power up its systems such as its transmitters and receivers. It was hoped that as the comet nears the Sun, more light would be available to power the lander and this indeed seems to be the case but so far only short intermittent communications have been possible. The team are trying different Rosetta orbits and communication methods to try to get better communications but there are several factors that make this process difficult. For communications to be attempted Rosetta, in its slow orbit, has to over the lander, and the lander has to be facing the Sun so that it has power. It's estimated that the window for good communications will be somewhere between 10 minutes and 3 hours at each attempt. Another problem is the fact that the comet is becoming more active and it is essential to protect Rosetta. The biggest threat to the spacecraft is the quantity of dust which might interfere with Rosetta’s ability to track the stars. Rosetta navigates by detecting the positions of the stars and if it gets confused by thinking dust particles are stars, then it might decide it has a problem and enter safe mode in which all science stops until it gets corrective communications from earth. In the worst case this could mean Rosetta is out of action for weeks. Never the less, whether Philae communications are restored or not, a great deal of science is being performed by Rosetta as C67P becomes ever more active as it approaches its nearest point (186 million kilometres) to the Sun on 13 August 2015. Rosetta was launched on 2 March 2004 with a mission to study comet 67P/Churyumov–Gerasimenko and to land a probe "Philae" on its surface. The first risky challenge for Rosetta was the Mars flyby which was used to brake Rosetta's velocity to allow it to rendezvous with earth again for an even greater velocity increase. This manoeuvre, nicknamed "The Billion Euro Gamble", involved the spacecraft being shadowed from the Sun for a 15 minute period. Without solar power the batteries (which were not designed for such a long period of darkness) could have been completely drained effectively killing the spacecraft. Therefore Rosetta was placed into a standby mode to conserve power but awoke as planned when sunlight returned. As Rosetta approached earth for its next slingshot it was detected from earth and was briefly designated as minor planet 2007 VN84 - a 20m diameter object. Since Rosetta was on a path that would take it within 5000 km of earth it caused some concern before an astronomer recognised the orbit as being that of Rosetta's. This small asteroid (roughly 4.6km diameter) was passed at a distance of 800km and 8.6 km/h during which images and scientific data from 15 instruments was successfully captured. Because of its diamond shape, all of the craters have been named after precious stones, the largest crater has being called "Diamond". After a brief loop round the Earth, Rosetta's next rendezvous was with the much larger asteroid, Lutetia. At about 100km in diameter, this asteroid has been known since 1853. Passing just over 3000km away, Rosetta was able to take over 460 images and a huge amount of data with its sensors. This asteroid's denseness indicates that it has a high metallic content although the surface appears rocky in nature. Rosetta has determined that the asteroid is covered by a layer of loose rock/dust particles to a depth of perhaps 3 km. Rosetta entered orbit around this weirdly shaped, 4km wide, comet in September of 2014. As it approaches the Sun the increased heat will cause the comet to become more active as ice turns into vapour releasing gases and dust which will form the comets tail. The comet 67P/Churyumov–Gerasimenko was successfully landed upon by the probe "Philae" at just after 16:00 UTC, 12th November 2014. Unfortunately the lander bounced on landing an found itself lodged on its side next to a cliff which means it is hidden from Sun for much of the time. After completing all of its initial batch of science missions, the lander went into hibernation. This video is a wash-up of the landing and first few days of Philae's mission. Recent news indicates that the water contained in the ice of 67P is not the same as water on the earth. This causes a little more doubt in the theory that comets were responsible for delivering water to earth after it had cooled down from its initial creation. However, many more comets will need to be studied before this theory can be proved or disproved. For Information and video, visit BBC news. For full details of this mission, visit : ESA. Another good site for the latest news is NASA's JPL site. This animation shows the manoeuvres made by Rosetta in order to "throw" the Philae lander onto the comet and be in a position to receive data from it. As you can see, it is an amazing feat of navigation to get everything in the right place so that the lander hits the spinning (once every 12.5 hours) comet at the desired location. For a full explanation by ESA, please visit this ESA page. This animation was originally created as many small animations charting Rosetta's and Philae's mission. Now that the spacecraft part of the mission is over, thay have been combined into this single animation.... Keep your handkerchief ready.